The SR 26 Bridge across the S. Fork of the Mokelumne River (30-0022) is similar to the SR 26 Bridge across the N. Fork. They both have a deep T beam main span over the river, but the S Fork Bridge only has single approach spans. The superstructure sits on hefty pier walls with pedestals on top to support the shorter beams of the approach spans. The bridge is 120 ft long with a 60 ft main span and 30 ft long approach spans. This bridge was built in 1936 (77 years ago) but for some reason it's not eligible for the National Register of Historic Places. Deck, superstructure, and substructure are all 'Good' and the bridge has a sufficiency rating of 73.5. Like the Middle Fork Bridge it carries about 4000 vehicles a day through a scenic part of California. I wanted to provide a screenshot from my Adobe Photoshop Lightroom software showing the location of the North, Middle, and South Fork Bridges carrying SR 26 in Calaveras County. I've been using GPS4Cam software on my iPhone to get the lat. and long. 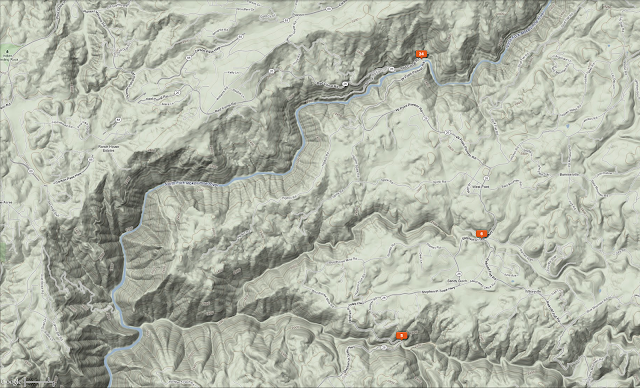 for my photos and automatically place them in different kinds of maps (terrain, satellite, road) in Lightroom. Calaveras County, California Bridges: SR 26 Bridge across the S. Fork of the Mokelumne River by Mark Yashinsky is licensed under a Creative Commons Attribution-NonCommercial-ShareAlike 3.0 United States License.